This in a continuation from part 1. If you need help connecting the ESP32 to JTAG, see this post. 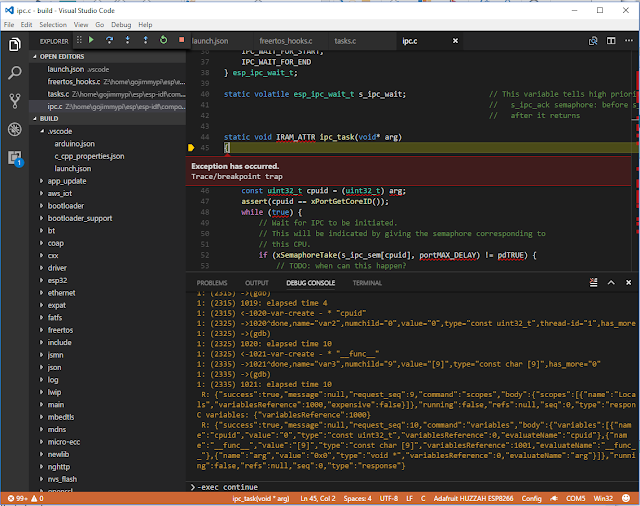 After setting up the ESP32 toolchain and confirming regular GDB debugging is working as described in my previous post, now it is time to configure VSCode for remote debugging of the ESP32. I've also added Part 3 - using ESP WIP OpenOCD. 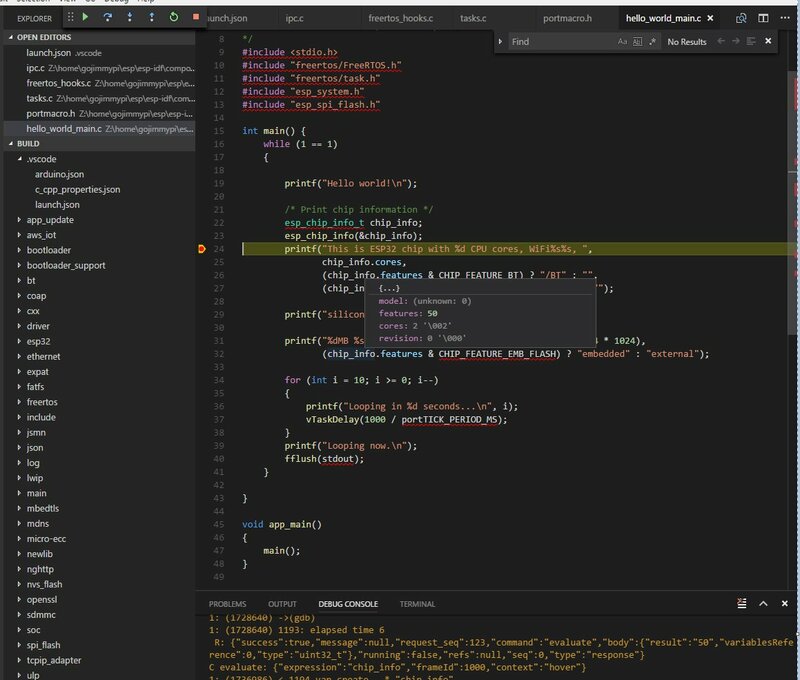 Everything is pretty straightforward here, well except for the details of actually debugging in VSCode. I had quite an ordeal with that, as described in github issue #763: Remote Debugging of ESP32 causes EXCEPTION: System.ArgumentOutOfRangeException. 1: (812903) ->@"esp32.cpu0: Target halted, pc=0x40080E77\n"
1: (812932) ->~"/home/ivan/e/crosstool-NG/.build/src/gdb-7.10/gdb/inline-frame.c:171: internal-error: inline_frame_this_id: Assertion `!frame_id_eq (*this_id, outer_frame_id)' failed.\nA problem internal to GDB has been detected,\nfurther debugging may prove unreliable.\nQuit this debugging session? " 1: (812932) ->~"(y or n) [answered Y; input not from terminal]\n"
1: (812932) ->&"\nThis is a bug, please report it." /home/ivan/e/crosstool-NG/.build/src/gdb-7.10/gdb/inline-frame.c:171: internal-error: inline_frame_this_id: Assertion `!frame_id_eq (*this_id, outer_frame_id)' failed. I opened an espressif issue on giuthub for this one: [TW#12876] VSCode Debugging via MI causes internal GDB error #645. Fortunately - with the help of @pieandcakes - I was able to determine a (yes, somewhat wonky) sequence of steps to persuade VSCode to debug the ESP32! Unable to start debugging. Unexpected GDB output from command "-interpreter-exec console "target remote 192.168.174.129:3333""
is optional, but tremendously helpful in actually seeing what's going on between VSCode and the ESP32. In this same "compile window", it can be helpful to run the serial monitor. I like keeping it in the same window as make/building, so that I am sure to stop the monitor when reflashing. We just wanted to confirm OpenOCD was working and that we could connect with linux GDB, so exit/quit. That's the one that calls the Windows GDB client to talk to the Ubuntu OpenOCD server. This gives us the best of both worlds: assimilation! Here we can have all the reliable compile of ESP32 code in linux, yet the ability to edit and debug from Windows! Pay attention to the forward and back-slashes in the launch.json file. See vscode-cpptools issue #706. Be sure the OpenOCD server is running as described above. Press F5 to start debugging. You should see "Exception has occurred.Trace/breakpoint trap." It appears we are debugging, but we are not. Target (appears to be) running. VSCode thinks it is paused. If you try to single step here, all bets are off; xtensa GDB crashes, VSCode debugging stops. Game over. Otherwise if all is still going according to plan: type -exec continue at the VSCode > prompt. (16086) ->@"esp32.cpu0: Target halted, pc=0x400F4AB3\n"
ERROR: Cannot execute this command while the selected thread is running. Only after the above steps are completed, now press the pause button. Observe output. There should be no errors. Press a code-stepping button, such as Shift-F11.... tada! Single step debugging! "if esp-idf is in the project folder symbols get found automatically. for windows you can also add the msys2, mingw32 and xtensa-esp32-elf bin folders to the path in tasks.json. make monitor has some trouble starting a console, you can edit the idf_monitor.py to output to stderr(task output window), or make a .cmd file with the python command in it and run that command from tasks. 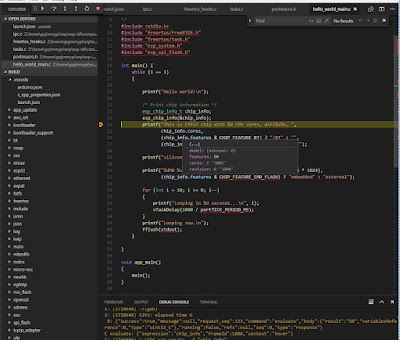 You can see how I work with it esp-idf-VSCode-template"
I'm still working on polishing these instructions. Hopefully you've found this useful. Feedback is welcome and appreciated. Send me a message on twitter, github pull request or gmail. GDB tip: Ctrl-x Ctrl-a in gdb to enter TUI mode. Note that as of May 2017, there's an issue in VSCode regarding the direction and quantity of path slashes as note in gitbub vscode-cpptools issue #706. If you see something like this there's a good change the JTAG adapter ended up on the default ttyUSB0 port. Edit the config or change the plug order. Somehow over the course of time, my old friend "ifconfig" fell out of vogue, It is now simply "ip a". I don't really like it; harder to read. So you may need to install net-tools if ifconfig does nto work for you to determine ip addy. Don't leave OpenOCD / GDB running when recompiling.